Our users are 1 Step away from making a purchase; if you have the products, let’s place it right in front of them. List your online store on Pricekart.com and we will make it visible to the right buyers. Build trust with the buyers with a verified tag with verification process and a small monthly fee. 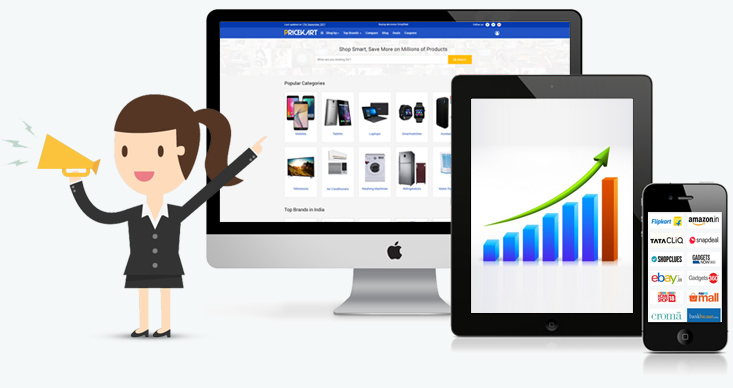 PriceKart Verified stores can submit their products to multiple categories which will be displayed to our users when they are looking for products. PriceKart Verified Stores can Setup CPC ads with a flexible budget, 70% cheaper than any online CPC marketing but 100% relevant clicks. Ensure that your online store gets a boost of up to 100% in sales by partnering with Pricekart. Being listed on our page allows us to do all the work for you and increase the traffic towards your online store. All the products on your online store can be automatically updated and listed on Pricekart without any efforts. Every new product or change in price is automatically updated on our site for you to relax and enjoy the benefits of getting more traffic and growing your business. At Pricekart, we offer our shoppers a wide range of products from various online stores. Just like an online shopping mall, we keep adding new products to offer our users a wide array of options to choose from. This keeps the shoppers coming back and in turn letting you reach your target audience. Our Sales Dashboard gives you a detailed insight into all the daily updates, conversions, categories, popular products, and popular searches and much more for you to rest assured regarding the money that you spend. We believe in working cost-effectively and that is what sets us apart from other competitors. With your store being listed on our page, you will only pay for the traffic that you get on your online store without any other additional costs. By partnering with us, you can rest assured that we believe in utmost transparency. We ensure to display all the exact and precise numbers and conversions rates for you to be secure regarding the money that you spend without any hidden costs.